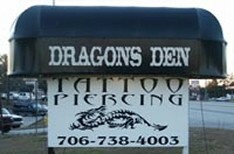 The Dragon's Den is the only place to go for tattoos and piercings in Augusta, Georgia!Our fully trained staff of professional artists are sure to find a way to give you the artwork you have always wanted. With a selection of more than 40,000 designs, you'll be sure to find the right tattoo. You can also bring in your own drawing or just your imagination and allow us to create a custom design to adorn your skin! In addition to tattoos, we offer a variety of exotic body piercings. Expressing your personality couldn't be any easier! Come in! Ask Questions! So what are you waiting for? We're always looking forward to working with fresh skin! Contact us today or come by our Augusta, Georgia, tattoo studio and see why we are the best in the business for tattoos and piercings,—from eagles wings to earrings, we're the BEST! Our staff of professionally trained piercers have over 10 years experience each. We offer a full line of body piercings ranging from the standard to the extreme. Nothing is taboo here at The Dragon's Den. 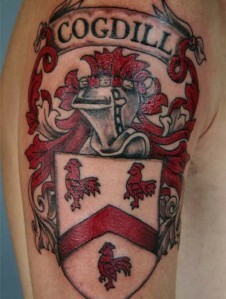 Our qualified artists have the ability to create any type of tattoo or perform any piercing. We love mixing custom freehand art with flavor from traditional, new school, or just about any other style you can think of. Your imagination is what sets the limit! Dream up anything in black and grey or full color, and we'll take care of the rest! All you need to do is drop by and share your ideas with us. The Dragon's Den uses autoclave sterilization, new needles, and safe, sterile procedures for each and every tattoo and piercing.